Who can enter: Any registered Nipper (2018/19 season) from under 9's - under 14's. Enter your child into the wave that corresponds to their Nippers age group. This event is for the budding ocean swimmer! We know the kids love to get in and have a go with their friends so this event is open to all kids from ANY Nipper Club*. 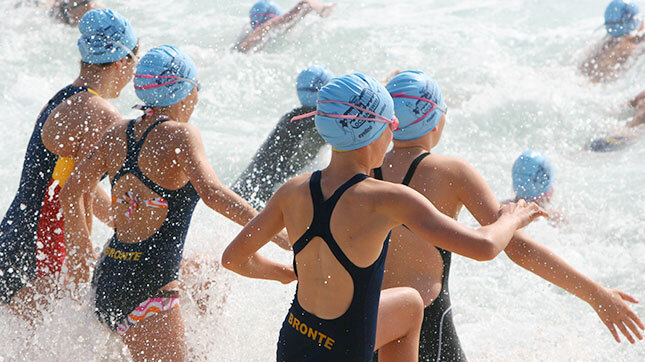 This event is only open to Nippers as it is vital that all kids swimming in the Banana Boat Bronte Junior Ocean Swim are proficient in the ocean, as Bronte is known for it's challenging surf conditions. * Age groups are as per their 2018/2019 Nipper age groups. It is important you hydrate, eat a little, warm up & stretch - MOST IMPORTANTLY KNOW THE CONDITIONS OF BRONTE BEACH. The compulsory swimmer briefing will cover what the conditions are on the day, the course and the directions for swimmers to take and have an enjoyable swim. Bronte Beach can be affected by both wind a swell, so it is important to come down early and check out the conditions, look at the course and plan your best approach.If you are not sure, ask one of our caring water safety team whom will be happy to assist you. All swimmers need to mark off their name on the morning at the registration tables in the Bronte SLSC. Registrations open at 7:30am, so you can collect your timing ankle strap and your wave's coloured swim cap. Late entries will be accepted on the day - $15 cash only. There will be a late entries table set up from 7:00am - please bring the correct cash to help out! Results will be available on the website from around 2:00pm on the Sunday. Prizes will be presented at the finish line shortly after the event has finished - please stick around. Fastest boy and girl in each group will win a great prize. Our sponsors and event partners will be donating these prizes, with more details to follow. We recommend public transport or try to car pool with friends to reduce costs and the traffic congestion in the area. Bronte Beach offers paid parking in the cutting on the south side of the beach and there is 2 hour timed parking in most streets around the beach. Bronte Beach is linked by the 379 bus service from Bondi Junction Railway Station . Take the bus marked "BRONTE" (not North Bondi) from stand E at the interchange.